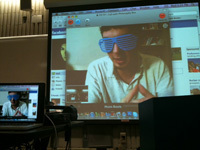 2/22: “Mad Max: Warrior Road,” student led discussion. 9/23: Our Annual Ethical Dilemmas discussion! The UMD Philosophy Association holds weekly events in LARTS 118 on Wednesdays from 4:00 - 6:30 PM. A schedule can be found below and our Facebook page is regularly updated. Folloe us on Twitter UMD_Philosophy_Club. All are welcome! Events are free of charge! No philosophical experience required! 4/15 Student Research Presentation: Natalie Tessicini "Denying Autonomy: Disability in the Free Will Debate"
4/8 Relay for Life Team Fundraiser Game Night! 4/1 Christopher Larkosh (UMD) "The Importance of Language Study, Linguistics and World Travel for Young Philosophers"
3/18 Spring Break -- read MORE PHILOSOPHY! How Propaganda Works. Preparation for his visit on 4/29. 3/4 Student Research Presentation: Jessica Latta "Charles Mills: Philosophy of Race and Critical Race Theory"
2/11 Valentine's Day Meeting: What is Love? The UMD Philosophy Association holds weekly events in LARTS 204 on Wednesdays from 4:00 - 6:30 PM. A schedule can be found below and our Facebook page is regularly updated. All are welcome! Events are free of charge! 11/26 Thanksgiving -- no meeting! 11/12 Prof. Robert Sherwin presents on the Philosophy of Music. 11/5 Prof. Eckert provides an introduction to Philosophy of Time, focusing on McTaggart's article, "The Unreality of Time"
10/29 Filippo Casati (University of St. Andrews) provides a Skype lecture, "Richard Routley: An Encounter"
10/22 Daniel Allen (Philosophy Student) presents on the Philosophy and Nature of Horror. 10/15 Student-led discussion of Time Travel and viewing of "Donnie Darko." 9/24 Ethical Dilemmas!" Our annual discussion session of classic moral problems lead by Jessica Latta (UMD Philosophy Major). If you want some practice with this kind of thing, you should check out: http://www.philosophyexperiments.com (particularly the first three games and the "Morality Play" game). 9/17 Planning Meeting: Join us as we plan our activities for this semester and academic year -- pizza will be served! 9/10 Corsair Fair 1:30 - 5:30 Stop by our table! The UMD Philosophy Association holds weekly events in LARTS 120 on Wednesdays from 4:00 - 6:30 PM. A schedule can be found below and our Facebook page is regularly updated. All are welcome! Events are free of charge! Jessica Latta, Thomas Medieros, Omari Steans. "Quine, Meinong and Heidegger - What is Water?" Nineteenth-Century Philosophical Arguments on Slavery and Marriage." The Philosophy Association RFL team will meet on Cressey Field. 4:15 - 7:00 PM in AUD 007. 3/26 Speaker Prof. Eckert (Philosophy): "Is Owning Pets Immoral?" 3/12 Film viewing and discussion: "Man from Earth"
3/5 Guest speaker: Prof. Steven Baden (History): "Theory of Suffering"
The UMD Philosophy Association holds weekly events in LARTS 107 on Wednesdays from 4:30 - 7:00 PM. A schedule can be found below and our Facebook page is regularly updated. All are welcome! Events are free of charge! Dec. 4 Last Meeting of the SemesterStudent Chris Crogan presentation "Brains, Robots, and Cognition: Towards a Computational Theory of Semantics"
Nov. 20 Guest Speaker Prof. Dien Ho (MCPM) "Cruelty Cap and Trade -- Offsetting One's Cruelty Footprint." Oct. 23 Ashely Nunez (UMD Philosophy Major) will lead discussion on sustainability and philosophy: "How we can understand the topic of sustainability as humans and also as philosophers, and also what the field of philosophy can contribute to the discourse on sustainability." She will show a video and hold an open discussion on these topics. Oct. 16 Monday Schedule today-- a low-key filmviewing is planned. Oct. 9 Chris Crogan (UMD Philosophy Major) will present his research on John Searle's Chinese Room Argument. Oct. 2 Special Guest speaker! Henri Le Chat Noir, the world's first and foremost feline philoospher, and the Thieving filmmaker Will Braden will join us via Skype to discuss life, the universe and hairballs. Henri's website. Sept. 25 Ethical Dilemmas!" Our annual discussion session of classic moral problems lead by Jessica Latta (UMD Philosophy Major). If you want some practice with this kind of thing, you should check out: http://www.philosophyexperiments.com (particularly the first three games and the "Morality Play" game). Sept. 11 Corsair Fair 12:30 PM - 5:30 PM Stop by! May 1 Prof. Asher Walden will be giving a talk about epistemology in Asian Philosophical Traditions. End of the year! Laughter! Tears! April 24 Prof. Tara Lyons (English Department) will be giving a talk on the film "Anonymous." April 17 No meeting today--Monday Schedule! March 13 Student Officer Elections, film viewing: "Stranger Than Fiction"
Feb 20 Film viewing: "Paprika"
Feb 13 Professor Eckert will be giving a talk entitled "Why be one self when there are so many selves we can be?" She will be discussing Daniel Dennett's view of the Self and Fernando Pessoa and his heteronyms' poetry and other writings. Feb 4 Film viewing: "Kumare"
The UMD Philosophy Association holds weekly events in LARTS 120 on Wednesdays from 4:00 - 7:00 PM. A schedule can be found below and their Facebook page is regularly updated. All are welcome! Events are free of charge! October 10 Film viewing: "Pontypool"
October 3 "Ethical Dilemmas!" A discussion session. If you want some practice with this kind of thing, you should check out: http://www.philosophyexperiments.com (particularly the first three games and the "Morality Play" game). September 26 Film viewing: "The Philosopher Kings"
September 12 Corsair Fair 1:30-5:30 at the Campus quad behind the Maclean Campus Center. The UMD Philosophy Association holds weekly events in LARTS 113 on Wednesdays from 4:00 - 7:00 PM. A schedule can be found below and their Facebook page is regularly updated. All are welcome! Events are free of charge! Deviant Logic Posse (advanced logic reading group): Wednesdays 10:00 AM and 11:00 AM at the Writing Center and at 6:30/7:00 PM LARTS 113. April 4 Faculty Presentation and Guest Speaker: Profs. Jennifer and Michael Mulnix (Salem State University) will be giving a talk "Who is the Happiest Person." The meeting is in LARTS 117 (instead of 113). This talk is co-sponsered by the Honors Council. March 28 Faculty Presentation: Prof. Phil Cox "Philosophy of Law." Professor Phil Cox will be giving a talk on the philosophy of law. He will discuss some general ideas within the field. This is a great opportunity for anyone considering taking the Philosophy of Law class or anyone interested in studying law in the future. March 14 Faculty Presentation: Prof. Maureen Eckert "Paradoxes of Time Travel" followed by film viewing of "Donnie Darko"
March 7 Faculty Presentation: Prof. Catherine Gardner "Women in the History of Philosophy" Followed by film viewing "Agora"
February 28 Faculty Presentation: Prof. Andrew Rotondo "Disagreement and Skepticism"
February 22 Discussion: Ethical Dilemmas!!! February 15 Film viewing and discussion: "Another Earth"
Prof. Tim Nulty: Guest lecture "Martial Arts, Embodied Intentionality and Merleau-Ponty." Prof. Steven Baden: Guest Lecture, "Gnostic Legacies: Philosophical and Theological Musings." Guest Skype-in: Prof. Ricki Bliss (University of Melbourne) "Vicious Infinite Regresses (Again)"
Preparation for Logic Event on Friday 11/4. Love or Lust? A discussion and debate. Student discussion leader will be Gildas Robert. Special Event! 4:30 - 5:30 David Chalmers (Australian National University & NYU) will Skype-in to speak on "Philosophical Zombies, Wild Thought Experiments and Philosophy." Mystery meeting! A puzzle, dipped in riddle sauce and wrapped in a condundrum. Come for the unknowing, stay for the knowing. What is Art? Prof. Eckert will guide us through questions and issues pertaining to the nature of art. Show and Tell meeting: Bring a piece of art, picture, website link, or other example of art that you like. Ethical Dilemmas! Trollies, Murder Buttons, Infinite Pain or ultimate destruction?...decisions, decisions. Discussion leader Ian Saccardo will guide us through a variety of thought experiments. General Interest Meeting 4:00 - 7:00 LARTS room 113 Discussion and planning of meeting topics and activities this semester. Pot-luck snacks. Chomsky @ MIT 9/22 Roadtrip planning. Corsair Fair 1:30 - 5:00 Cenetennial Way (shine) or Campus Center (rain). Join us at the Philosophy Association table! The UMD Philosophy Association holds weekly events in LARTS 116 on Wednesdays from 4:00 - 7:00 PM. A schedule can be found below and their Facebook page is regularly updated. All are welcome! Events are free of charge! Ms. Elle Benjamin (UMD Philosophy Major and graduating senior) will present her research for Independent Study, "Fundamentality and the Grounding Relation." Matt Hogan (UMD Physics Graduate Program) will talk on Philosophy and Cosmology. Prof. Tim Nulty will present "Embodied Intentionality and Chinese Martial Arts: the Myth of the Mental." Special Event: Zach Weber (University of Melbourne) will give a talk, "A Paraconsistent Model of Vagueness." "It's All so Vague" Professors Eckert and Donahue team up for a double presentation on vagueness and the Sorites Paradox. This meeting will set the stage for Zach Weber's presentation at next week's meeting. Film viewing: "Exit Through the Gift Shop"
Special Event: Colin Caret (University of St. Andrews) presents a guest lecture on Newcomb's Paradox, 12:30 - 1:45 PM LARTS 112. At 5:00 PM he will present a talk on John Slaney's "A General Logic" in the Writing Center. Film Viewing: "Slavoj Zizek: The Reality of the Virtual"
Special Guest Speaker via Skype: Philosophy Bro He's "just a Bro who likes philosophy," and he's hilarious. The main topic of his talk will be Heidegger. Film viewing: "The Bothersome Man"
The UMD Philosophy Association holds weekly events in LARTS 117 on Wednesdays from 4:00 - 7:00 PM. A schedule can be found below and their Facebook page is regularly updated. Come see Graham Priest, Agustin Rayo, Jay Garfield, Richard Heck and JC Beall in a roundtable symposium on non-classical logic. We'll be livestreaming this event, so people across the world can watch and question these esteemed logicians. Philosophy Study Fest: All philosophy students are welcome to join our group study-paloosa! A Philosophy doctoral student becomes infected by a vampire and addicted--to what? An interesting film by director Abel Ferarra. Winter Fest: Join us at our table in the Campus Center from 6:00 - 8:00 PM. Deck the Halls Competition: We have reserved the "cave" area in the campus center and plan to build a festive Plato's Cave. The Cove is a documentary about a team of activists who set out to try to end the dolphin slaughter that occurs every year in Taiji, Japan. Prof. Eckert will be presenting on Plato and Literary metafiction. She will be teaching a class on Paradox, Self-Reference and Metafiction next semester. Abstract: Metafictional literary works are characterized as texts constructed such that they draw attention to themselves as works of fiction. Various narrative devices further this effect, including elements of self-reference, authorial intrusion, stories within stories, etc. Although this label tends to be applied to contemporary fiction, works from other eras have been considered ‘metafictional’, such as Cervantes’ Don Quixote and Homer’s Odyssey. I will propose that the curious chronological placement of dialogues from the Theaetetus through the Phaedo (and, perhaps, even further, through to the Parmenides’ frame) and the missing “promised” dialogue, the Philosopher, can be interpreted as a metafictional move. Minimally, I will suggest that the Apology, Crito and Phaedo are inter-textually positioned to be the Philosopher, although I think a stronger case could be developed such that the Philosopher extends circularly through the corpus. Professor Timothy Nulty (UMD) "Why You Are Not Yourself and the Limits of Authenticity." Prof. Nulty will be presenting on Heidegger. The title of his talk is "Why You Are Not Yourself and the Limits of Authenticity." Professor Nulty will be teaching a class on Heidegger next semester, as well as an existentialism & phenomenology class. Those of you interested in Heidegger/Existentialism in general should definitely plan on attending! This documentary follows the four-year search for the reincarnation of Lama Konchog, a world-renowned Tibetan master who passed away in 2001 at age 84. The Dalai Lama charges the deceased monk’s devoted disciple, Tenzin Zopa (who had been in his service since the age of seven), to search for his master’s reincarnation." Prof. Walden’s presentation will cover the first three books of Spinoza’s Ethics. Open discussion will follow. Filmmaker Astra Taylor explores the application of contemporary philosophy to everyday life by speaking with leading philosophers in settings that underscore the tangible relevance of their theories. Taylor's subjects include Princeton University professor Peter Singer who discusses the ethics of consumption -- while strolling amid the sumptuous luxury of Fifth Avenue. Taylor also interviews Cornel West, Michael Hardt, Judith Butler and others." Abstract: Modal and relevant logics were forged in the furnace of non-classical semantics, yet there is an important sense in which -- despite much common ground -- they remain incompatible paradigms. This talk is an attempt to clarify where the two traditions part ways, and to use this to shed light on the nature of relevance.